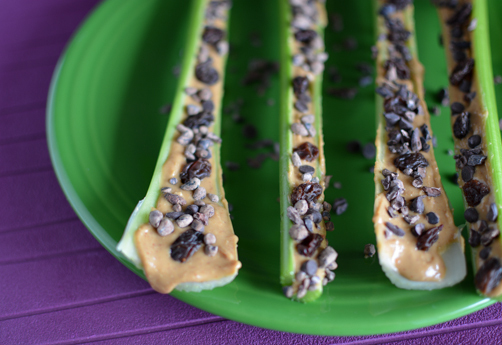 Can you believe today’s snack doesn’t have an apple in it? There have been so many lately but I’m deviating a little today. I wanted to revisit ants on a log. I’ve done a few celery recipes. 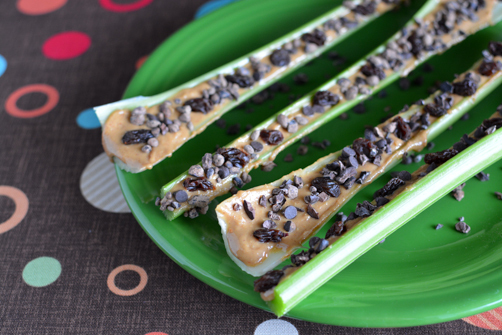 Do you remember Ants on a Hill or almond cheese filled celery sticks? They are delicious! I really wanted to call these Raving Ants on a Log but since I’ve never been to a rave or raved, I thought it would be a little disingenuous. I can relate to afternoon slumps at work though. Two and three o’clock hits and you’re ready to put the coffee on again or go for a walk outside. These babies are the perfect answer to the afternoon slump. They provide a nice source of protein via peanut butter, a little sugar from the chocolate chips and raisins, and caffeine/rocket fuel from the cacao nibs. Cacao nibs are crumbled from whole cacao beans that have been peeled. 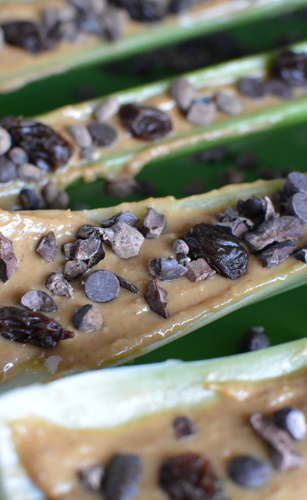 They are the ultimate dark chocolate chip. They have a coffee chocolate flavor in my opinion and are great sprinkled on snacks like this, oatmeal or smoothies and even blended in smoothies. Nibs are a rich source of vitamins, minerals, fiber and antioxidants. 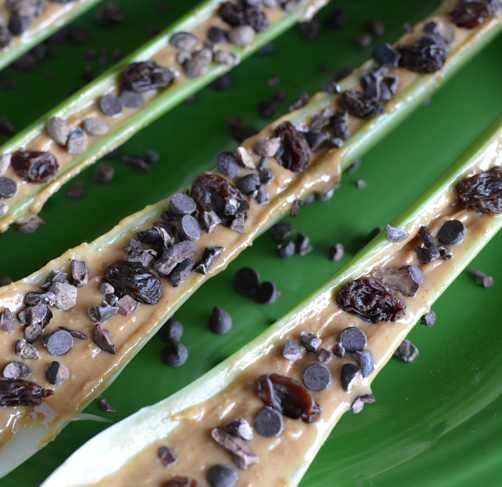 Fill celery sticks with peanut butter, sprinkle with raisins, cacao nibs and chocolate chips. Enjoy! Have a few of these, share with a co-worker and get outside for a walk! How do you get through the afternoon slump?